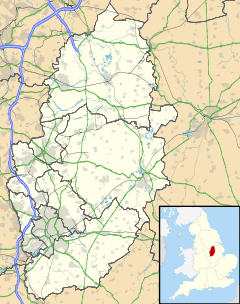 East Drayton is a village in Nottinghamshire, England. According to the 2001 census it had a population of 212, increasing to 252 at the 2011 Census. It is located 3 miles west of Dunham-on-Trent. The parish church of St Peter and St Paul is 13th or 14th century in date. Nicholas Hawksmoor the architect was born here. A windmill was recorded at East Drayton in 1712, a post mill with a full width enclosed porch and porthole-like windows with shutters. It was possibly moved here from Lincolnshire. The village has a typical English pub with a Scottish hint, it also has a village sports club with a Saturday Football team during the winter months and in the summer a Saturday and Sunday cricket team. ^ "Area: East Drayton CP (Parish)"
^ "Civil Parish population 2011". Neighbourhood Statistics. Office for National Statistics. Retrieved 8 April 2016. ^ Pevsner, Nikolaus. 1979. The Buildings of England:Nottinghamshire. pp 113–114. Harmondsworth, Middx. Penguin.